2018 Martin County 4-H Poultry Chain – Huge Success! Greetings Martin County! This is a very special week for Martin County 4-H. October 7-13, 2018, is National 4-H Week. We celebrated a few days early with our annual Poultry Chain Show and Sale. We are also celebrating through the end of October 19 by collecting items for pet shelters that were affected by Hurricane Florence. If you would like to donate items, please call the Martin County 4-H Office for more information. Now…back to the chickens! The 2018 Martin County 4-H Poultry Chain Show and Sale was held October 4, 2018, at the Martin County Farmers Market. In April of this year, chicks for the Poultry Chain were ordered and twelve Martin County 4-H’ers registered to pick up chickens for the project. From April to October youth raised their birds. They made sure that their chickens hade quality food and clean fresh water every day. Youth also made sure that the pens for their animals are clean and their animals are healthy. These participants were required to bring back their three best birds for the show. 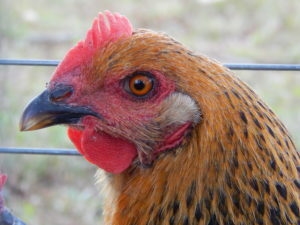 The chickens are judged as a pen of three and they are judged on characteristics suitable for laying hens. Youth participants also competed in a showmanship competition with their chickens. In late September, these 4-H’ers attended a workshop to learn how to properly show one of their birds. This workshop was lead by Susan Tyre, Martin County 4-H Agent. Youth were taught how to display their chickens and answer the judge’s questions about their projects. The poultry chain was a huge success! Andy Burlingham, N.C. Cooperative Extension of Pitt County Livestock Agent served as the judge for both the laying hen and showmanship competition. Grand Champion Pen of Three Chickens was awarded to Pierce Williams and Reserve Champion Pen of Three Chickens went to Exum Taylor. The Junior Poultry Showmanship Grand Champion was awarded to Ava Godwin and Junior Poultry Showmanship Reserve Champion went to Noah Abel. Along with the laying hen and showmanship competitions, each pen of birds was auctioned off. Youth use the money raised from their poultry projects to go towards their college funds and other expenses they may have had with their poultry projects. This year, our auctioneer was Mr. Lawrence Swain, of Columbia NC. He did an excellent job and the poultry auction brought in a total of over $700.00. Martin County 4-H would like to thank all of our donors and buyers for contributing to this event! The twelve youth participating in the 2018 Martin County 4-H Poultry Chain were Anna James Parnell, Jamie Holliday, Chloe Blake, Palmer Williams, Dylan Harrison, Exum Taylor, Pierce Williams, Caden Manning, Noah Abel, Maddie Parnell, James Holliday, and Ava Godwin. For more information on Martin County 4-H, or how to participate in the 2019 Martin County 4-H Poultry Chain, please contact Susan Tyre at 252-789-4370 or via email at susan_tyre@ncsu.edu. • How Do I Care for Baby Chicks?